Our Best Value! Buy more and save! 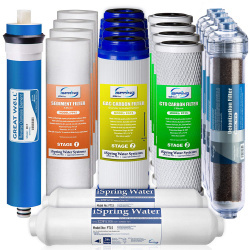 Compatible with most Reverse Osmosis systems (including brand names) and Under-counter filters in the market. Ideal for Reverse Osmosis systems, Whole house water filters, Ice makers, and Aquariums. 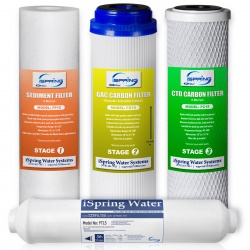 The F22-50 filter kit is a 3 year filter supply for 50GPD 5 stage RO systems. The filters are standard size and will fit most 50 GPD 5 stage RO systems that use standard sized filters. Each filter is individually wrapped to preserve freshness. 6x High-Capacity 5 Micron 10" Polypropylene Sediment Filters (FP15) -- Removes dust, particles, and rust. Replace about every 6 months. Tested by independent third-party to meet NSF/ANSI Standard. 6x Granular Activated Carbon (GAC) 5 Micron 10" Filters (FG15) -- Gets rid of unpleasant chlorine, tastes and odors, cloudiness and colors. Replace about every 6 months. Tested by independent third-party to meet NSF/ANSI Standard. 6x Carbon Block (CTO) 5 Micron 10" Filters (FC15) -- Removes any residual chlorine, tastes & odors, compounding the pre-filters' efficiency and extending the RO membrane's life. Replace about every 6 months. Tested by independent third-party to meet NSF/ANSI Standard. 1x High Rejection .0001 Micron TFC Reverse Osmosis Membrane (MC5) -- The heart of the RO system. Produces drinking water at a rate of 50 gallons per day. Replace about every 2-3 years. Tested by independent third-party to meet NSF/ANSI Standard. 3x Total Polishing Inline Post Carbon Filters (FT15) -- Removes any possible residual tastes and odors from the tank. Replace about every 12 months. Tested by independent third-party to meet NSF/ANSI Standard. FT15 Dimensions: 9 7/8" L x 1 7/8" W. FT15 uses threaded 1/4" NPT fittings. Most brand name 5-stage 50 GPD RO systems that use standard 2.5 x 10 cartridges. 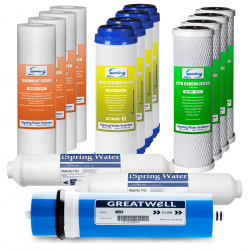 1 year supply of replacement filters for 5 stage 50 and 75 GPD RO systems. Individually wrapped to preserve freshness. Fit standard 10" housings, including most brand name models. 2x 5 Micron 10" Sediment Filters (1st Stage, FP15): Removes dirt, rust, sand, and other particles. NSF certified. 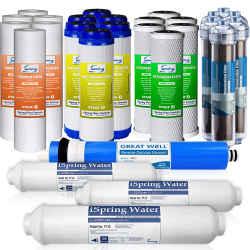 2x 5 Micron 10" Granular Activated Carbon (GAC) Filters (2nd Stage, FG15): Absorbs chlorine, halide, organic contaminants, odors, and other impurities that contribute to bad tastes and odors. 2x 5 Micron 10" CTO Carbon Block Filters (3rd Stage, FC15): Further removes any remaining chlorine, tastes, and odors. 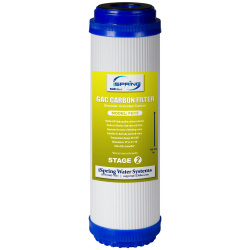 1x Post Carbon Inline Filter (5th Stage, FT15): Polishes the water from the tank before it is delivered to your faucet. Most brand name 5-stage 50 or 75GPD RO systems on the market. Length = 9 3/4", O.D. = 2 7/8"
The F22-100 filter kit is a 3 year filter supply for 5 stage RO systems. The filters are standard size and will fit most 100 GPD 5 stage RO systems that use standard sized filters. Each filter is individually wrapped to preserve freshness. 1x High Rejection .0001 Micron TFC Reverse Osmosis Membrane (MC1) -- The heart of the RO system. Produces drinking water at a rate of 100 gallons per day. Replace about every 2-3 years. Tested by independent third-party to meet NSF/ANSI Standard. Most brand name 5-stage 100 GPD RO systems that use standard 2.5 x 10 cartridges. 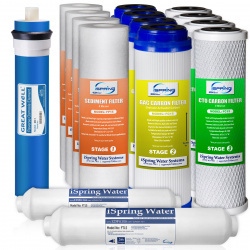 The F22-75 filter kit is a 3 year filter supply for 5 stage RO systems. The filters are standard size and will fit most 75 GPD 5 stage RO systems that use standard sized filters. Each filter is individually wrapped to preserve freshness. 1x High Rejection .0001 Micron TFC Reverse Osmosis Membrane (MC7) -- The heart of the RO system. Produces drinking water at a rate of 75 gallons per day. Replace about every 2-3 years. Tested by independent third-party to meet NSF/ANSI Standard. Most brand name 5-stage 75 GPD RO systems that use standard 2.5 x 10 cartridges. The F15-500 filter kit is a 2 year filter supply for the 5 stage tankless 500GPD commercial RCS5T RO unit. Each filter is individually wrapped to preserve freshness. 4x High-Capacity 5 Micron 10" Polypropylene Sediment Filters (FP15) -- Removes dust, particles, and rust. Replace about every 6 months. Tested by independent third-party to meet NSF/ANSI Standard. 4x Granular Activated Carbon (GAC) 5 Micron 10" Filters (FG15) -- Gets rid of unpleasant chlorine, tastes and odors, cloudiness and colors. Replace about every 6 months. Tested by independent third-party to meet NSF/ANSI Standard. 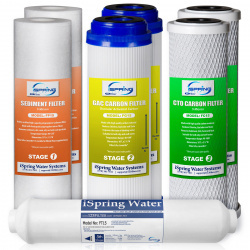 4x Carbon Block (CTO) 5 Micron 10" Filters (FC15) -- Removes any residual chlorine, tastes & odors, compounding the pre-filters' efficiency and extending the RO membrane's life. Replace about every 6 months. Tested by independent third-party to meet NSF/ANSI Standard. 1x High Rejection 500GPD dual flow TFC Reverse Osmosis Membrane (MS5) -- The heart of the RO system. Produces drinking water at a rate of 500 gallons per day, rejecting a wide spectrum of impurities down to .0001 micron. Replace about every 2-3 years. Tested by independent third-party to meet NSF/ANSI Standard. 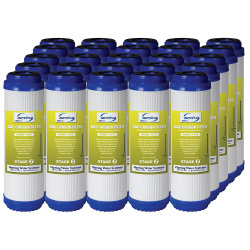 2x Total Polishing Inline Post Carbon Filters (FT15) -- Removes any possible residual tastes and odors from the tank. Replace about every 12 months. Tested by independent third-party to meet NSF/ANSI Standard. 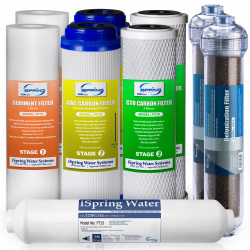 The F15-75 filter kit is a 2 year filter supply for 5 stage RO systems. The filters are standard size and will fit most 75 GPD 5 stage RO systems that use standard sized filters. Each filter is individually wrapped to preserve freshness. The F15-100 filter kit is a 2 year filter supply for the 5 stage 100 GPD RCC100P. The filters are standard size and will fit most 100 GPD 5 stage RO systems that use standard sized filters. Each filter is individually wrapped to preserve freshness. 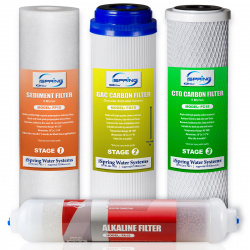 The F15-50 filter kit is a 2 year filter supply for the 5 stage 50 GPD RO systems. The filters are standard size and will fit most 50 GPD 5 stage RO systems that use standard sized filters. Each filter is individually wrapped to preserve freshness. High-quality 9 3/4" x 2 7/8" Granular Activated Carbon (GAC) replacement cartridge. 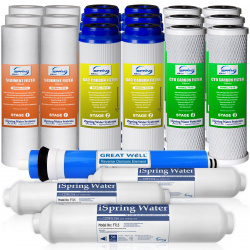 Absorbs chlorine, halide, organic contaminants, odors, and other impurities that contribute to bad tasting water. Protects the RO membrane and improves the taste of drinking water. Used as the 2nd Stage for iSpring reverse osmosis systems. Depending on your water usage and quality, it should be replaced every 3-6 months. Fits standard 10" filter housings, including most brand name models. Tested by independent third-party to meet NSF/ANSI Standard. 2x 5 Micron 10" Sediment Filters (1st Stage, FP15): Removes dirt, rust, sand, and other particles.